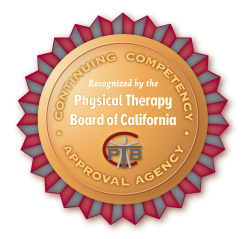 The Physical Therapy Board of California (PTBC) recognizes UE Seminars as an Approved Agency to Approve Providers of Continuing Competency Courses in California. All CE courses taken by California PTs and PTAs must be offered by either a PTBC Recognized Continuing Competency Approving Agency or by a provider that has been approved by one of the approval agencies. The recognized approval agencies may also be continuing competency coursework providers. An application must be completed for each course given by the CE provider agency for consideration of approval. All courses will be evaluated on the basis of compliance of section 1399.96. Click here for the California Code of Regulations for Physical Therapy: Article 13: Continuing Competency. CONTACT UE SEMINARS BEFORE SENDING COURSE MATERIALS FOR RUSH AND EXTREME RUSH All fees are non-refundable. An incomplete packet will not be processed. If incomplete, CE provider will be notified and additional fees maybe applied if packet is completed under 2 weeks from course date. Approvals are for one year, valid for one year from the date of the first course offering. After each approved course has been held the CE provider is required to submit a summary of the course attendee evaluations. If there is a change in the course title, instructors, content or number of contact hours, a new application will be required with the changes noted. A $30 approval fee will be required if the changes occurred during the one year approval. No course approvals are issued for a course that has already occurred. ***The approval does not imply endorsement of specific course content, products, or clinical procedures by this approval agency. You agree to indemnify and hold this approval agency harmless from any claim or liability with respect to the content of your course.